A sudden loss of a majority of one’s life-savings in middle or older age is associated with a significantly higher risk of death, reports a study published in the Journal of American Medical Association. The increase in all-cause mortality following a financial loss of 75% or more of net worth within a 2-year period is similar to the increase in mortality associated with a new diagnosis of coronary heart disease. The US Health and Retirement Study (HRS) had been interviewing every 2 years since 1994 more than 20,000 respondents, a representative sample of Americans over age 50. This longitudinal project is conducted by the Survey Research Center of the University of Michigan, and sponsored by the US National Institute of Aging and the Social Security Administration. Researchers of the present study draw upon HRS data on 8,714 individuals aged 51-61 at entry, 53% of them women, who had been first assessed for sudden loss of wealth in 1994 and followed up every 2 years through 2014. To study the association of financial shock and mortality, the researchers define the loss of 75% or more of total asset (net worth) over a 2-year period as a sudden negative wealth shock. They also assess the link between asset poverty, defined as 0 or negative net worth, and mortality. The researchers found that the experience of negative wealth shock was unexpectedly common – extrapolating to the present day American population 51 years or older, an estimated 26% experienced a negative wealth shock during the 20 year follow up, with a median loss of net worth estimated at $101,568 (in 2014 US dollars). An estimated 7% had long-term asset poverty during the follow up twenty years. There were 64.9 deaths per 1,000 person-year among those who had experienced negative wealth shock during the follow up years, compared with 30.6 deaths per 1,000 person-year for those without shock. The approximately 50% increase in risk of death is striking. Researchers suggest that a negative wealth shock exert a significant mental health toll, and also leave fewer monetary resources for health-related expenses. With limited years remaining to regain lost wealth, the health consequences of sudden wealth loss may be long lasting. The mortality rates were even greater among people who had no asset to lose. 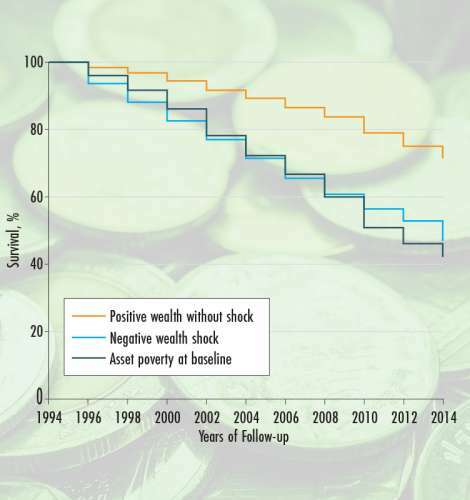 Among study participants with asset poverty at entry, the mortality rate was 73.4 deaths per 1,000 person-year, or 67% higher, compared with those with continuous positive wealth during the follow up years.